Art & Language, 100% Abstract, 1968, felt-tip pen on paper, 17 x 14". The exhibition “Uncompleted,” featuring the artist group Art & Language, is indescribable in the truest sense of the word: in part because the group’s members—ranging from Terry Atkinson to Michael Baldwin—have produced multifaceted work so heterogeneous as to elude classification to the greatest possible extent. But indescribable is also an apt descriptor because, since the end of the 1960s, the collective’s artistic practice has been based on discursive, theoretical, and thus largely linguistic activities, such that one can only reproduce, in fragments, the concepts that artwork by Art & Language—which locates art’s foundations in the act of writing—expresses and persistently reopens to discussion. With five hundred works, the pleasantly spacious exhibition offers a broad survey of the entire production of Art & Language, ranging from publications, documents, ephemera, and rare books to sculptures, installations, and paintings. 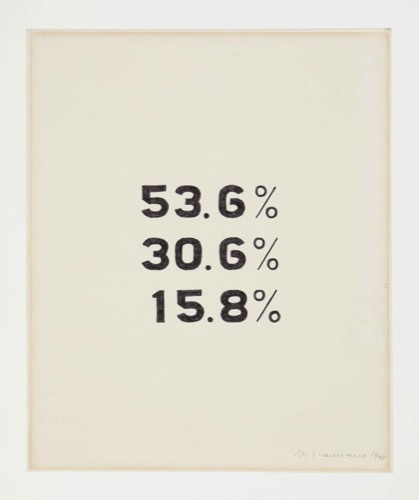 At the show’s center are large-scale groups of works, such as Index 02 (Bxal):Indexical Fragments 6, 1974. An entire space is dedicated to the magazine Art-Language (first published in 1969), which functioned simultaneously as a platform and tool for collaborative fields of action and as a promoter of art concepts and transporter of ideas. In this journal—which is exhibited in poster-size reproductions on the walls of the exhibition and at original scale in display cases—it becomes clear that Art & Language was not concerned with the programmatic justification of its own artistic production but rather with the articulation of a completely theoretical approach and an entirely new and self-contained artistic domain.